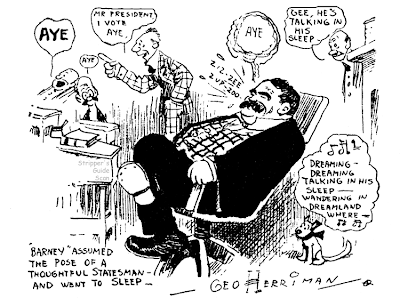 Friday, July 19 1907 -- These two small cartoons were included with a story about city councilman Barney Healy. Seems that Barney has been shepherding some legislation to guarantee poll workers a wage of $5 per day. Apparently in Healy's ward practically everyone of voting age is designated a poll worker, and Healy wants the city to pay them bribes on his behalf. Only problem is that when his pet legislation was put up to the vote at the last meeting, poor Barney was all tuckered out and fast asleep in his chair. Without his oratory to sway his fellow council members the matter was voted down. Now Barney is angered at the council for not giving him a nudge when it was time to vote, and of course his constituents aren't too happy since he's been promising them this $5 boon for months. Barney has taken pen in hand to the mayor, expressing his outrage at the behavior of the council and asking him nicely to force the measure to be re-introduced. 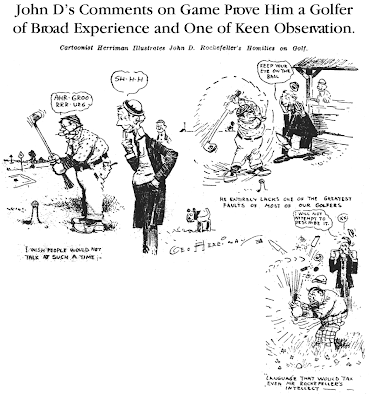 Friday, July 19 1907 -- Herriman pokes a little fun at oil magnate John D. Rockefeller for sharing with a reporter some of his golfing wisdom. To wit, (1) keep your eye on the ball, (2) don't speak when others are taking their strokes, and (3) refrain from using coarse language on the links. It's not hard to understand why John D. rarely talked to the press when they have no mercy over some offhand remarks about golf. Sorry about the quality of this image. It was in awful condition and I have a full plate of other activities today that keep me from giving it the usual restoration work. Unbelievable! Every time I check in there's something worth reading, even mind-changing sometimes! The Herriman is priceless and the names I never heard of are a real treat. Many thanks for what I consider one of the most stimulating art sites on the net! Thank you for the kind words Eddie. Plans for a movie based on "Barnaby," the comic strip distributed by Bell Syndicate are under way according to Crockett Johnson, author of the strip. A release at Bell's New York office says the picture rights have been transferred from RKO to an independent producer. Johnson is working on the script in New York in collaboration with Lewis Amster, Hollywood screen writer. RKO was reported to have paid a record $100,000 for the option on Barnaby. This could not be confirmed at RKO's New York office. New in the comic strip world, at least as far as daily newspaper syndication is concerned, is All Star Feature Syndicate's proposal to translate the great operas into strip sequences. The plan is to begin releases in January. All Star also is a publisher of comic books, but its director, Bernard Baily, has syndicate strip-making experience. He was, himself, the artist for "Vic Jordan," which appeared in PM about a year, and helped draw "Mr. X" for the Chicago Tribune-New York News Syndicate. He also did "Phyllis" for Keystone Features. All Star plans an optional arrangement. Newspapers may choose to run the strips, which adhere to the text of the original opera, or also can use an illustrated opera book tie-in. The books have previously been sold by All Star. Art work for the books is done by staff cartoonists. 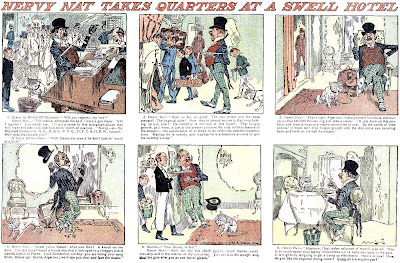 [Allan's note: I haven't been able to find either any examples of this newspaper strip, nor the book mentioned in the article. Can anyone help? Organized 15 years ago by the National Conference of Christians and Jews for the purpose of cultivating more space in newspapers on behalf of religious news, Religious News Service at first had to give away its material. Now, Religious News Service is a thriving news-gathering syndicate for more than 600 member newspapers, magazines, and radio stations which pay up to $200 a month for its daily mail, wire, and photo services. The agency boasts 400 news correspondents, a substantial part of them overseas. Popular features include "The Religious News Reporter," a script for radio, and "The Week In Religion," column. Since June 1945, when it began a photograph service it has acquired a library of more than 50,000 prints, built up by 200 correspondents. It has also a cartoon question box, "Religious Remarkables," a weekly column by Dr. Reinhold Niebuhr, and a calendar of future religious events. Here's our fourth and final feature from the 1909 go-round of the Judge syndicate. 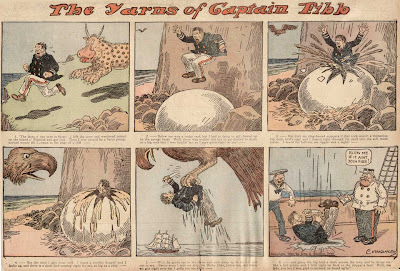 The Yarns of Captain Fibb was a product from the fruitful pen of Charles W. Kahles, a guy who seemed to have a feature with every syndicate, big or small. I'm told by Cole Johnson that the Kahles strip was contemporary material in Judge. Whereas the Nervy Nats were circa 1904, the Verbeck strips 1901-02, Captain Fibb was running in Judge in 1909. The Yarns of Captain Fibb made it through the entire Public Ledger run, from May 2 to September 5 1909. That does it for the 1909 Judge syndicate, and thanks once again to Cole Johnson for sharing this rare material with us. One final plea to you blog readers -- if you know of any other newspaper that ran this material I'd really like to hear from you. It's been said reprints of Capatain Fibb were seen in Sweden, inspiring pioneer animator Bergdahl to create the character "Kapten Grogg" for the Svenska Biograph. Several titles were made from about 1916-22. Today from the Judge syndicate (see the last two posts for more info) we have Gustave Verbeck's Stories Without Words. Shown here is the first episode. The title of the strip took awhile to settle in. On the second week the title was Wild Animal Stories Without Words, then Animal Stories Without Words, then finally alternating between the listed title and A Story Without Words. As usual with Verbeck, his simple drawings belied some very inventive plots, like the one above. The Verbeck effort was one of the ones that either Judge or the Public Ledger dropped when the 'section' was reduced to a single page. The run lasted from May 2 to August 1 1909. Nervy Nat is our second feature in the 1909 Judge syndicate offering (see yesterdays post for more on this rare short-lived syndicate). The series concerns a rascally ne'er-do-well who specializes in breaking into high society. The series was a favorite of Judge magazine readers. The great illustrator James Montgomery Flagg was responsible for most of the Nervy Nat material, but not all of it. 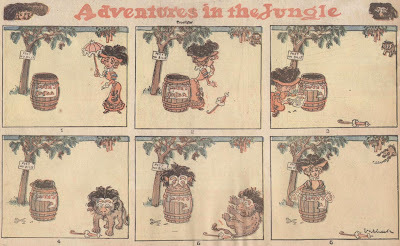 In the newspaper series of 1909 Arthur Lewis drew the majority of the strips, including the sample above. Nervy Nat also starred in a second newspaper series later on, but that's a subject for another post. Once again, thanks to Cole Johnson for the info and the scan. I just listed a 1909 Captain Fibb (Kahles) and a W. M. Goodes cartoon on ebay. (I was doing some research for the listing and found your blog.... Thanks!) See them under ebay Seller PrintSavior. Is your eBay ID meant ironically? It appears that your items are mostly prints razored out of magazines, a practice we collectors really dislike. Not at all. 'We collectors' is a generalization on your part. There are many collectors that are very appreciative of the items that I find (and save from the garbage heap -- no pristine books/magazines cut here) for them. I'm sure, of course, that you being a 'purist' have NO such items in your collection. BTW, I just listed a LITTLE JOHNNY and TEDDY BEARS (with Santa), and a LITTLE JOHNNY and TAFFY 'POSSUMS (with Santa) and am working on a NERVY NAT. Thanks again for your informative site. The humor magazine Judge made several attempts to syndicate reprints of their material to newspapers. This strip is from the rarest iteration of that unsuccessful plan, a 1909 effort that provided (apparently) two pages of material each week. Little Johnny and the Taffy Possums was the headliner for the two pages, and is actually a second go-round for Little Johnny. 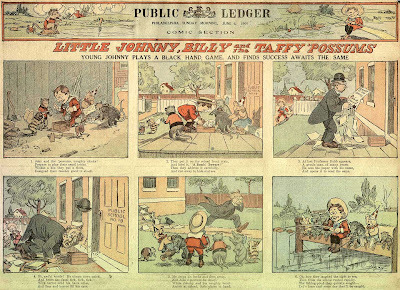 In 1907 the Judge Syndicate began distributed the original version of the strip, then titled Little Johnny and the Teddy Bears, to a small number of newspapers. The series lasted about a year and a half, and was, as far as I know, their only offering in that period. After the end of that series, though, Judge tried to syndicate the aforementioned two page section with four strips. In the Philadelphia Public Ledger, the only paper known to have run the 1909 Judge material, the section debuted on May 2 1909. John R. Bray, the artist on the previous Little Johnny series, continued with this new one. Unlike the previous series where the tooth-grindingly bad poetry was credited, this series allowed the writer to be blissfully anonymous. I'm told that the entire offering, including Bray's strip, are reprints from Judge. No new material seems to have been produced for the newspaper syndication. The Public Ledger ran the two pages of material until August 1, and then the Judge offering (or what the Ledger was willing to run of it) was cut back to a single page. Little Johnny didn't make the cut and ended on that date. A courtly tip of the hat to Cole Johnson who discovered this very rare material. When I indexed the Ledger in my haste I completely missed this short-lived experiment. Cole has not only provided me with an index of the material but has offered scans of each strip for our edification. We'll continue with the three additional strips the rest of this week. If anyone knows of any other paper that used the 1909 Judge material please let me know about it. Cole and I aren't convinced that the Public Ledger printed the entire run of the syndicate, so we'd be thrilled to be able to cross-reference with other papers. Nice artwork, but I see what you mean about the lame poetry ("...their teacher good to shock"??) Do you have any idea what were those hats this kid and Buster Brown wore? I've never seen one in a photo, only in comics. Jim's second panel this week has the same effect as that famous panel of Sarge from Beetle Bailey when he was sitting on the edge of his cot! Another thing Jim didn't mention is that 2D animation these days are outsourced to another country for cheaper labor. "The Simpsons", for example, is animated in Korea.